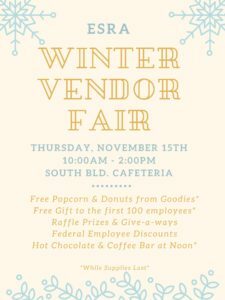 Join ESRA for the Winter Vendor Fair on Thursday, November 15th! The event will be from 10:00am to 2:00pm in the South Building Cafeteria in Washington, DC. Come by and see what specials and services the vendors can offer you. Participating Vendors include: Purchasing Power, Leafguard, Town Bank Mortgage, Prince William Home Improvement, BJ’s Wholesale Club, The Princeton Review, AgFed Credit Union, Sprint, Kitchen Saver, AXA-Advisors, SoleNVE, Modus Hotesl, Oakcrest Towers and MORE!